Unimore breaks new ground to improve the teaching quality and the reception service. 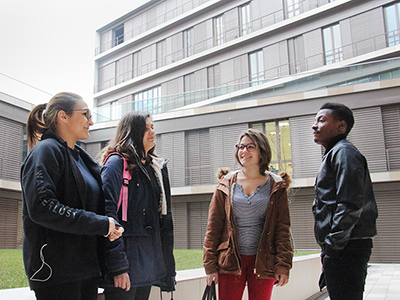 It will be the first University in Italy to start two new services for students next year: the classroom tutoring and the welcome and tutorial desk. Designed as tools to facilitate the study processes, curb student school leaving and promote the integration of international students in the university, the classroom tutoring and the welcome and tutorial desk are services offered to students by students. Senior students, i.e. those enrolled at least in the third year, will be eligible to apply for acting as classroom tutor, a role deemed useful to enhance dialogue and exchange with professors, or for working in the welcome and tutorial desk, addressed to international students requiring support and help in settling in and getting comfortable with the university and city context. Established upon request of the students to the university bodies, the innovative services aim to improve the study experience within the University and provide a further tool for the activities focused on internationalisation policies. A service available for the programmes with over 40 students enrolled, the classroom tutoring will be performed by a senior student who will ensure his presence in the classroom, and hopefully become a constant point of reference for the student colleagues, also for exchanging professor-student information. In addition, the tutor collaborates with the professor in charge of the teaching programme and with the Professor-Student Joint Committee. On the other hand, the student in charge of the welcome and tutorial desk service becomes a sort of assistant for international students, providing them information and contacts and helping them build a relationship network. The tutor activity is performed in close collaboration with the department and the International Welcome Desk. The commitment required to those willing to apply to these services will vary for the classroom tutor based on the number of students enrolled in the programmes (48 hours for programmes with up to 150 students, 72 hours for programmes with up to 300 students, 96 hours for programmes with over 300 students), whereas a commitment of 40 hours is required for the welcome and tutorial desk service. Unimore will pay students 9.00 euros net for the service. The requirements for the classroom tutoring role are relating to the university credits (CFUS) obtained, and for three-year graduates the assessment will be made based on the degree score. For the welcome and tutorial desk service, students are required to possess English skills and knowledge of financial circumstances. Candidates for the role of classroom tutor and responsible for the welcome and tutorial desk may submit their online application by Friday 14 September 2018 as per instructions provided in the calls for applications available on the website https://www.unimore.it/bandi/StuLau-Tutorato.html . Students eligible are those who for the a.y. 2017/2018 are enrolled in the 3rd year of the bachelors degree programme; at least in the 3rd year of the masters degree programme; or in the 1st and 2nd year of the two-year degree programme.